Purchase now & save $5! In order to achieve these objectives, readers must first learn exactly what their DiSC leadership style is! Each book comes with its own mini free DiSC profile test. This allows the reader to complete a brief assessment and receive more information on their leadership style. 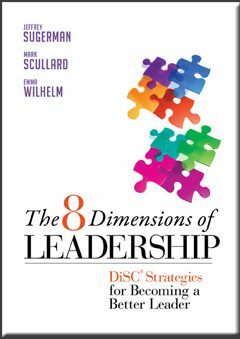 From there, the book will guide them through chapters designed specifically for leaders with that particular leadership style.Check out our full blog post on our DiSC Profiles blog to learn more about The 8 Dimensions of Leadership and how you can save $5 off your purchase (typically $22.95). What does leadership require? To be a leader is to make tough decisions – often being forced to choose between competing demands – but what makes it a truly messy endeavor is the fact that people are involved. People, in all of their complex glory, make leadership the art that it is. Leaders often need to orchestrate people around complex goals, deal with people who choose to resist, and try to gain alignment from people with a variety in interests. As you strive to grow as a leader, you’ll need to focus your leadership energy in new directions, and this will sometimes be a stretch for you. While you may land your first leadership role because of your outgoing nature and positive attitude, you may need to develop your analytical side to be more successful in your next role. The more responsibility you gain, the more you will probably be challenged to increase your competencies. Not only will you need to be a good with numbers, for example, but you’ll need to be seen as someone who can rally the troops when energy is lagging.